Deputy Sheriff Commander Jake Carson has his hands full with the investigation of a brutal multiple homicide, a troubled son and a vindictive ex-wife when he meets young, free-spirited paramedic Julie Jennings. He is immediately drawn to her and finds himself unexpectedly falling in love. Julie finds herself just as drawn to him. When Julie becomes the subject of an obsession, it puts both of their lives in extreme danger... 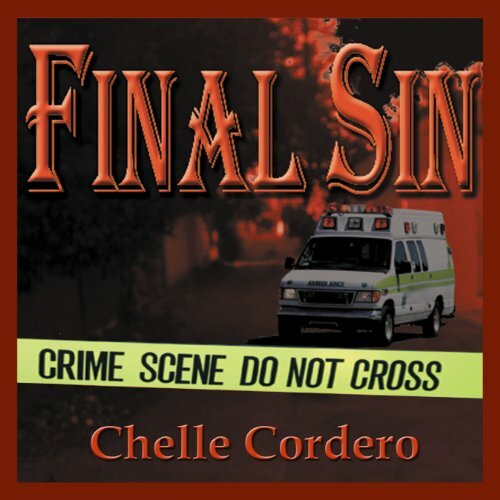 Romance... danger... adventure... suspense... another great Chelle Cordero novel sure to grab listeners from many genre! What would have made Final Sin better? This was the worst narration that I had ever heard! There were so many long pauses fromFrom chapter to chapter' that I thought there was a problem with the recording. The narrator also seemed to forget she was narrating a book because of her several mistakes. The story seemed an okay read, but the narrator ruined it! What didn’t you like about Gwendolyn Jensen-Woodard’s performance? it was really horrible..... I honestly can't find anything nice to say... Seemed liked it was very aamatuer-ish.. If you could play editor, what scene or scenes would you have cut from Final Sin? Save your money or credit. I throughly enjoyed the story but the narration was awful. Very amateurish. Long pauses at breaks and even mistakes still audible. I couldn't get past the pitch and quality of the narrator to the book. stopped listening within 5 minutes. A narrator that could read. I listened to 20 minutes of this book and then removed from my device. I have no idea if the story was good because the narration was horrible. This narrator was terrible. I don't submit many ratings and even if I don't care for a narrator I usually get used to them, but I could not stand listening to her. I stopped after 20 minutes and removed the story from my device. The narrator did not pause at the end of sentences, did not breathe in appropriate places and the reading was actually grating on my nerves.